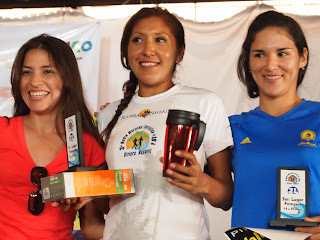 The Riviera Nayarit Touristic Half Marathon is already a ‘jewel’, not only for the beauty of the route that has been certified by the Mexican Athletics Federation and by the International Association of Athletics Federations, but also because Ema Leticia Joya, whose last name means ‘jewel’ in English, has won it three times in a row after crowning last Saturday November 19th. With over 550 runners registered for the competition –doubling last year’s list of participants— and the visit of International multimedalist Dionicio Ceron, who trained a group of competitive athletes from Guadalajara, the Third Edition of this marathon had a bright organization. “Is such a beautiful route, such a gorgeous place that I almost can´t believe I’m still in Mexico. This place is a privilege for al contestants”, said Dionicio Ceron. In the competition, the first runner to arrive to the finish line was a Masters category Ceron alumnae, running the 10K race. Felipe Reyes beat even the youngest athletes and was thrilled with excitement. “He’s the guilty one, he’s the guilty one”, shouted joyfully pointing in Dionicio’s direction. Angelica Calderon made it for the first place on the women’s 10K competition. For the 21K men’s race, there was a dramatic finish while Salvador Guerrero almost fainted on the finish line, where he arrived just a few seconds before a photo-finish arrival by Juan Carlos Razo and his own alumnae Carlos Fernando Gonzalez. Electronic system gave Gonzalez the second place. Finally, at the women’s 21K race Ema Leticia Joya showed why is she the Queen of this route, arriving on the finish line with more than 10 minutes advantage over her closest competitor. “High endurance sports are a key niche to attract tourism in Riviera Nayarit, as they deal with people who are strongly focused on achieving goals, and who also have purchasing power and a well developed environmental culture, which provides the ideal conditions to promote our destination and to generate economic benefits for everyone”, said the President of the Convention and Visitors Bureau (CVB) of Riviera Nayarit, Fernando González Ortega.